McNabb to Raiders? Al Davis BETTER go for it! I am in no way,shape,or form an Oakland Raiders fan,but if I was,I’d be on my hands and knees to Al Davis begging him to get Donovan McNabb to be their next quarterback. Let’s face it,the Raiders have been in the toilet for over eight years now. Ever since their defeat in Super Bowl XXXVIII,it hasn’t looked good. And even though I’ve taken a lot of joy from their failures,whether it be to get good players or win games or even to get their home games on television, there’s part of me that feels bad about them. No football fan likes to see their team lose and continue to lose. I know this is the case in Oakland,I know that Raider fans are pissed. They’re pissed that the team hasn’t had a winning season since 2002. They’re pissed that the team hasn’t drafted well (Darrius Heyward-Bey,JaMarcus Russell,Robert Gallery) and that guys like Randy Moss and Javon Walker couldn’t cut it there. And worst of all, they’ve gone through quarterback after quarterback after quarterback. 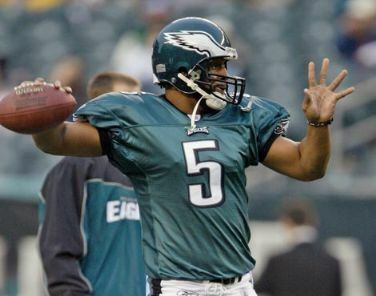 Which leads us to McNabb, a proven quarterback who gave the Eagles 11 years of success and led them to five conference championship games. The Eagles are, in my opinion, crazy for wanting to let go of the guy who has been the face of their franchise for so long because they’ve gotten rid of their star tailback, Bryant Westbrook last month. Why would you get rid of your quarterback,too? It makes no sense,but in any case,the Raiders are in the sweepstakes for McNabb. If I was Al Davis, I would do what I could to get him, and it seems he is trying to do just that. The Eagles want a Top42 draft pick for McNabb, however the Raiders are dangling Nnamdi Asomugha in front of them in exchange for the 34-year-old quarterback. The Raiders need to do whatever it takes to get McNabb. The Raiders would be a lot better with him than Russell,or Bruce Gradkowski, or whoever is not named Donovan McNabb. I think they need to do what they can to make this team better. Even though the Raider hater in me would hate for this to happen, the football fan in me says it’s an upgrade for the Raiders if they go for it.